What if the best “Special Weapons And Tactics” existed only if you had “Systems Working All Together”? 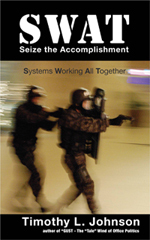 SWAT is the story of accomplishment; namely, how do accomplishments get designed and planned? Using the principles of systems thinking, Timothy Johnson merges his experiences as a business consultant and a tactical law enforcement photographer to produce his most compelling story yet. Did my trainer sabotage my efforts? I’m currently in a 8-week internship and have 2 weeks left and need to finish strong and gracefully. During my internship, I was assigned to someone who’s supposed to teach me about the experimental methods and data analysis of my project… Next week, I want to ask my boss for a reference, but am concerned that my trainer potentially sabotaged my efforts. How can I analyze crime if I’m stonewalled? How do I approach my boss to discuss a raise? Office Karma: I wonder when will she get hers? Part II: I was let go unfairly. Should I tell Board Member? My ‘old’ Boss still expects me to do work for him! How do I work with a snake? What can we do about a coworker’s messy desk and body odor?